June 15, 2018 Dan O.
Bernard (Jim Rash) and Huey (David Koechner) are two pals that used to be the best of friends, however, they haven’t seen each other in quite some time. Life has gone on, careers have taken their tolls, and oh yeah, their various escapades with women have changed them, but is it for the better? Either way, they meet back up after all of these years when Huey is desperate for a place to stay and decides to hold-up in Bernard’s nearly-empty apartment. Bernard has no problem with this because he’s got nothing much going on in his life; after a divorce and a couple of failed relationships, he’s just sort of hanging around, working at his publishing-company, and trying to do whatever he can to pass the time. Then, he meets Huey’s daughter, Zelda (Mae Whitman), and things get a little weird for both guys. Bernard and Huey was apparently an old comic-strip from the 50’s and you can sort of tell; the material about women, life, love, work, and all that seems incredibly dated, with the only slight mention of phones and the internet to keep some of it moderate. But mostly, it’s the sexual-politics that keep this thing from ever seeming like it was written for, and/or taking place in the current-day. It’s the kind of movie that likes to have its two male protagonists groan on and on about their frustrations with women, what women give them in order to succeed, and how, in some odd ways, they feed off the energy from women. David and Goliath together at last! Yeah, it’s a little odd and you can tell that the material needed a few more updates to really work, because what those behind it think is smart and witty insight into the male-mind and ego, comes off like a lame attempt at trying to do what Woody Allen did and usually succeeded with. Instead of being witty, or even funny, these guys are just sort of awful human-beings, who complain about a lot of stuff, aren’t really all that interesting, and don’t really seem to make much of sense, when you get to thinking of them. The way in which these two are written, Bernard and Huey are supposed to be a lot older; rather than growing up in the 50’s beat-poetry days, or even the rock’n’roll swing of the 60’s, they’ve grown up in the early-to-mid-80’s somehow. Yet, neither one is really old enough to have grown up as college-age kids at the time, like the movie insists. So whatever insight these characters have to give us, no matter how grandiose or tiny it may be, just doesn’t quite work or even connect. And it’s treatment of women as a whole, is still a bit sketchy. If anything saving this is that Rash and Koechner, both playing incredibly against-type, have a sweet and solid budding-chemistry that helps the other out in ways they wouldn’t expect. Rash is straight-laced and surprisingly dark at times, whereas Koechner gets to play a bit of a man-child that drops metaphysical beliefs while tipping his fedora and the two are both weird side-by-side, yet in a conversation, work hand-in-hand. It almost makes you wish that the movie they’re working with had been better, the material had been a lot fresher, and above all else, the characters just been interesting to make us want to hear them yammer on for hours-on-end. Eventually, there comes a time to move on, grow up, and shut the trap. 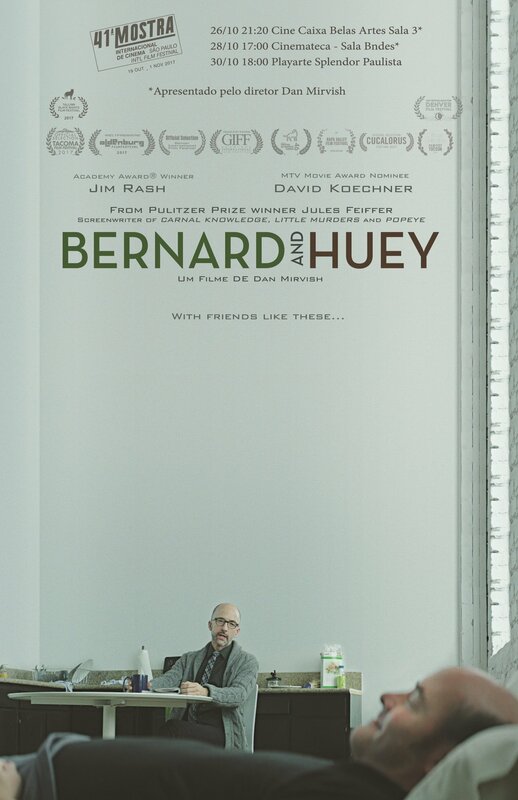 Consensus: Try as it cast might, Bernard and Huey feels like a script that’s gotten lost in the shuffle since the 60’s and hasn’t really gotten updated, nor reworked to offer anything interesting to do or say. Seriously though, that fedora’s rockin’!